I trained as a supervisor with the Institute of Person-Centred Learning. The course tutors were Irene Fairhurst, Tony Merry and Andrea Uphoff. A total of 15 trainees met for 5 residential weekends in 2003. 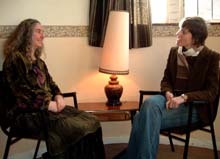 I began working with supervisees at the end of that year and gave my final presentation of my work to 3 of my peers and tutors in March 2005, as a result of which I received the Diploma in Person-Centred Supervision. Sadly, Tony Merry had died the previous summer. I regard supervision as a collaborative relationship where supervisor and supervisee are working together to understand issues which arise for the supervisee in his/her client work. Frequency of meetings for supervision will depend upon your personal circumstances - which will be affected by the requirements of your training course or professional body. I offer supervision to both trainee and qualified counsellors.